You are the reason behind all our successes this year. We celebrate your gracious efforts everyday. Liberian children & youth are happy because of your generous heart! Spreading the news: Uniting Distant Stars Co-Founder & Country Director, Kelvin Fomba, was interviewed on United Methodist Radio 98.7 FM in Liberia on Friday 11/11/16. He was accompanied by two of our youth leaders Roseline Sonday & Patrick Junusa Jr. and shared on what we accomplished with your help and where you will take us next. 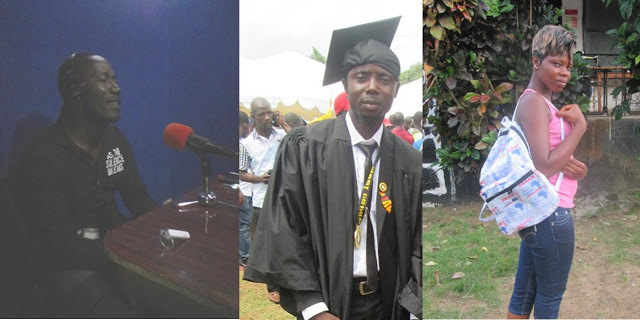 ​Left to Right: Kelvin’s interview at radio station; Patrick at his college graduation earlier this year; & Roseline wearing one of the backpacks she helped make. Today, a local artist painted the UDS logo on our new center. 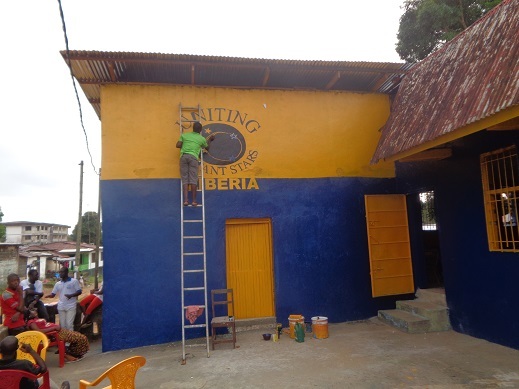 Adding our brand to our building is another way to spread the news about your unyielding support of Liberian children & youth. Your generosity is making a different for children & youth in Liberia. Save the date: Thank you for being a valued part of the Uniting Distant Stars Community. Each year, generous Star Supporters like you celebrate Give to the Max Day by making your online donation on GiveMN.org. Your generosity on this makes a difference far beyond the 24-hour giving event. ​Your generosity on Give to the Max Day will provide Liberian children & youth with the “Tools for Success“. Thank you! 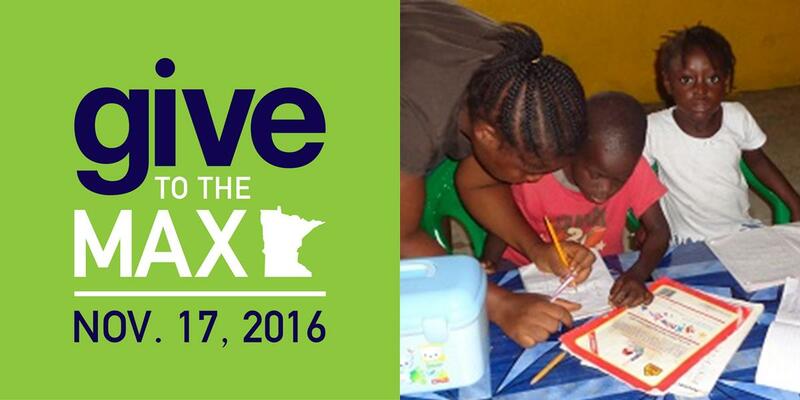 Please join us on November 17, 2016, for Give to the Max Day and help us continue to change lives through providing education & vocational training. Your donation on Give to the Max Day also may help UDS receive an additional donation of $1,000. How? On November 17, every gift made on GiveMN.org will be entered into an hourly drawing for a $1,000 GiveMN Golden Ticket to be awarded to a non-profit organization. Your gift of $10 or more could instantly turn into an $1,000! And, here’s the really exciting part: Two donations made on GiveMN.org during the Give to the Max Day campaign will be randomly selected to receive a $10,000 Super-Sized GiveMN Golden Ticket! The more gifts we generate on GiveMN.org during Give to the Max Day, the more our chances increase to receive that additional 10,000 donation. Image what we could do with $10,000 to help children & youth in Liberia. Our goal is to raise $5,500, and you can help us reach it! Your generous gift will buy additional copies of books for our library, 12 more used computers for our lab, and 8 sewing machines for our training program. These are the “Tools for Success” needed for Liberia’s children & youth to get the upper hand in developing knowledge and skills. ​Your fabulous gift will add more books to our library (left), additional computers for our lab (center) & sewing machines for our training program (right). Be sure to mark your calendar and make your gift on November 17 by visiting our campaign page “Tools for Success: Books, Computers, & Sewing Machines” at GiveMN.org. Thank you for being our valued Shining Stars! This entry was posted in Uncategorized and tagged #GTMD16, Books, Computers, education, Give to the Max Day, GiveMn, Liberia, Library, Treadle Sewing Machines, United Methodist Radio 98.7, Vocational Training. Bookmark the permalink. ← You Brought “Happy” to Young Liberian Students!